With two races beating the trails of the Bonnet Carré Spillway, you'd think they would be nearly identical. However, nothing could be further from the truth. This past Sunday was the 27th running of the Spillway Classic, the New Orleans Track Club's unique signature event in Norco, Louisiana. I picked up my race number on Thursday at Phidippides in Metairie. Having registered in advance as an NOTC member and using a $5 promo code, the $17 registration (including fees) was a steal. Also, I was impressed with the well designed soft style t shirt provided to all participants. Registering early, using those discounts, and staying current on club dues definitely has its perks! 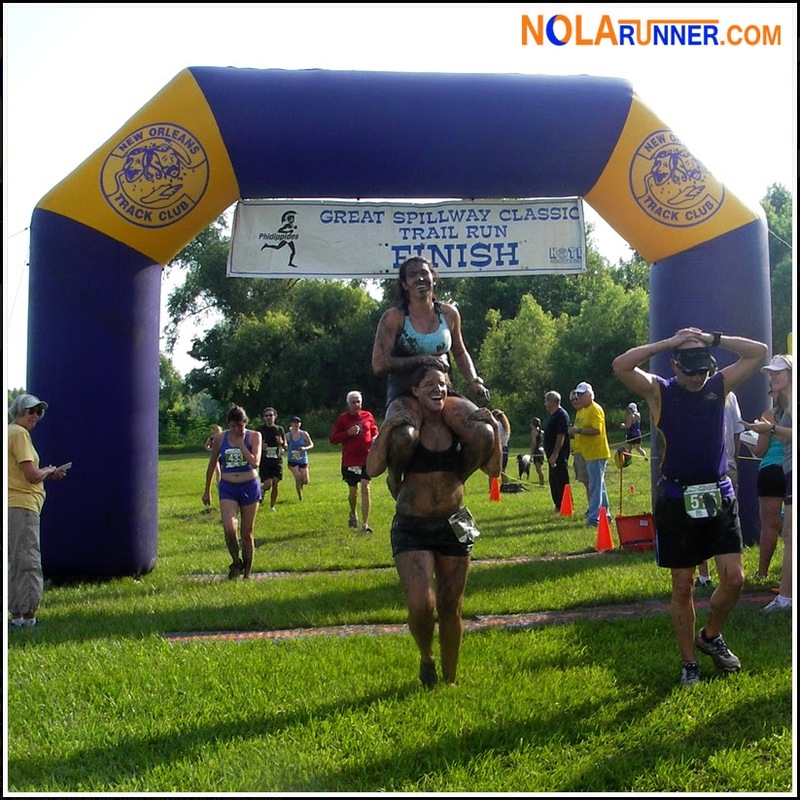 I trekked out to the race on Sunday morning with Katherine, who was tackling her first Spillway Classic. She was excited about the event thanks to the numerous positive reviews she read in the past. I spent the time giving her a rundown on the best ways to avoid getting completely covered in mud, but we were prepared for the messiest race possible. Race time was 8am, and it started promptly as scheduled. The first half of the race takes runners up the side of a flood protection levee, and along the ride for about a mile and a half. This segment seems never ending, as the sun beats down aggressively in the early morning hours. 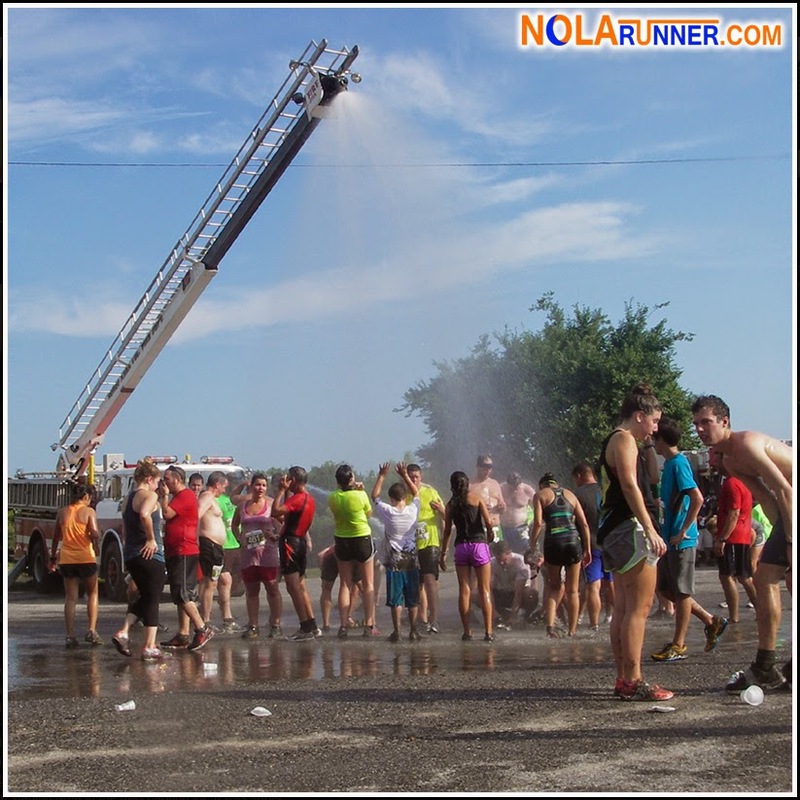 There was a water stop just before runners took a hard left back down the levee in to the neighboring foliage of the spillway. At the base of the levee's descent is where runners enter "the gauntlet." Depending on weather in recent days, this is where muck is maneuvered, shoes are lost, and photos opportunities are at a premium. Unfortunately, the days leading up to this year's Spillway Classic were relatively dry, so the mud puddles weren't waist deep like previous years. I stayed as far left as possible to keep as dry as possible, but still managed to get some markings up to my knees. After exiting the gauntlet, the remainder of the race is a straight shot along trails bordering the Spillway's watery lagoon. The trails are narrow thanks to the dense treeline; however, the shade from the canopy provides a nice respite from the summer heat. I had a difficult time passing fellow runners during this segment, and regretted not positioning myself further up in the pack during the wider parts of the route earlier in the race. After crossing under the NOTC arch, I hung around to catch a photo of Katherine finishing her first Spillway Classic. We grabbed a snowball, checked out the jambalaya from Cook Me Somethin' Mister, and walked back to the car to towel off and return to civilization. Fortunately, neither of us got too grimey and didn't need to utilize the hose-down provided by the local fire department's water truck. The Spillway Classic clocks in at roughly 3 miles, and has one water stop. Personally, I'd like to see the location of that water stop moved up a half mile to the first mile marker, and have another aid station added around the second mile marker. The July heat on top of the levee is intense, and opportunities to hydrate sooner and more often would be welcome. Also, with the remote areas that the course explores, the second water station would also serve as a location for any runner who may need medical attention mid race. I'll admit, trail running isn't one of my strengths. It's not even my ideal race situation. I don't usually care to run anywhere other than on pavement, I don't like getting dirty, and the narrow paths trail runs cover limit the freedom I typically enjoy during workouts. However, the break in the monotony is nice during the summer months, and I'm glad the New Orleans Track Club and other local organizations offer this diversion. The events are well executed, fun, and quite the spectacle for participants and spectators alike. One of these days I'll have to make it to the post-race party at the Spillway Bar to experience the spectrum of the day's entertainment. From what I hear, it's not to be missed. 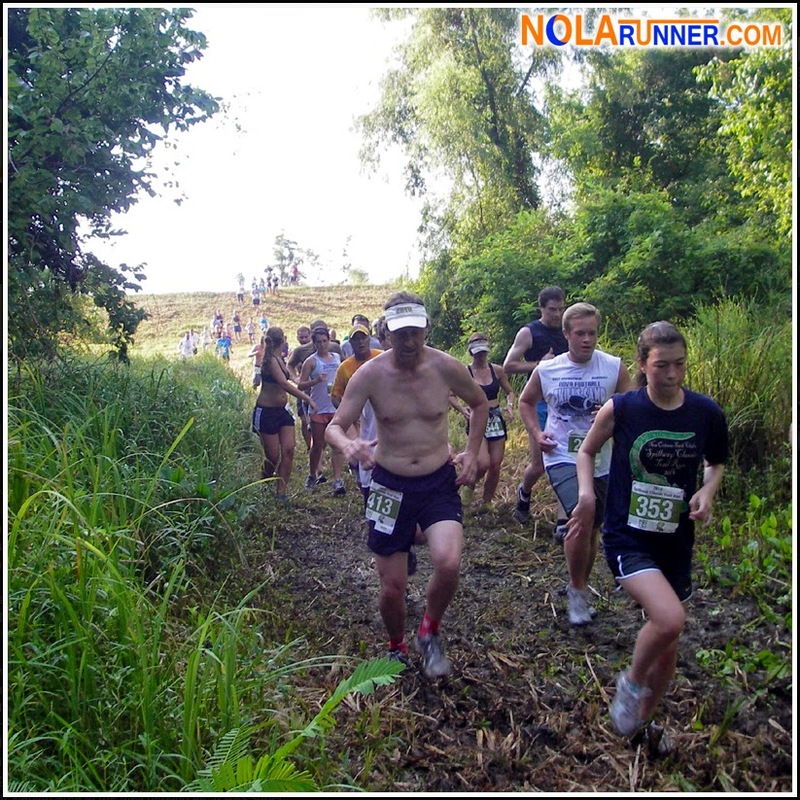 For complete results from the 27th Spillway Classic Trail Run, click HERE. View photos from the race in the gallery below. If you can't see the gallery, LIKE the NOLArunner Facebook page HERE.